Gelatin is used in many industries, not just for food. It is used in photography, pharmaceuticals, glues, and cosmetics. In the food industry, gelatin is used for its ability to act as a gelling agent. You will find it in the ingredient list for any gummy candy, marshmallows, but also in margarine, yogurt, cream cheese, and low-fat processed foods. Gelatin is not a vegan food, but there are substitutes if you don’t eat meat. These include agar and carrageen, both of which come from seaweed. Gelatins labeled as kosher are often vegan. So why should you add gelatin to your smoothie recipes? There are many reasons. The amino acids that are prevalent in gelatin have great health benefits, and most of us don’t get enough of them in our diets. Here are the top health benefits attributed to gelatin. Protein: Why consider using unnatural, processed protein powders when you have this natural source available? Gelatin contains between six and twelve grams of protein in every tablespoon. It does not include a complete protein, but it is a significant source of many of the amino acids you need in your diet. Digestion: Gelatin naturally attracts and binds water to itself, which means that when you add it to your diet, foods that you consume move more easily through your digestive tract. Detoxification: Glycine, one of the main components of gelatin, is an amino acid that helps the liver function well. You need your liver functioning because it is responsible for eliminating toxins from the bloodstream. Joint Health: There has been some research that indicates gelatin can help promote healthy joints and bones. Gelatin comes from the joints and bones of animals, so it only makes sense that it would help with ours. The proteins in gelatin may help prevent the degeneration of collagen that occurs naturally with aging. It has even been shown that eating gelatin reduces stiffness and pain in joints afflicted with arthritis. Sleep: It’s glycine to the rescue again. This amino acid has been proven to increase the quality of sleep when consumed regularly. Getting more glycine in your diet will also reduce your drowsiness during the day. Weight Loss: Gelatin may increase the amount of human growth hormone that your body produces. This in turn helps to increase your metabolism so that you burn more calories. Additionally, the high protein content of gelatin means that it keeps you feeling full longer. Ulcers: Gelatin has even been shown to reduce the size of stomach ulcers. It is believed to act by healing and strengthening the mucous lining of the stomach, which helps to heal ulcers, but also to prevent them from forming in the first place. 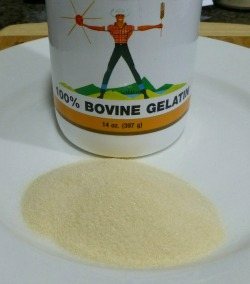 Are all gelatins the same? No. Some gelatins have additives. Look for the highest quality gelatin that is 100 percent pure. See my recommended brands below under where to buy. Do vegan substitutes for gelatin have the same nutrient profile? Unfortunately, no, the seaweed substitutes do not have the same superfood components that gelatin does. Carrageen and agar are largely made up of complex carbohydrates and fiber. They may not have the same health properties as gelatin, but they can be used when you need a gelling agent for a recipe. Is bone broth the same thing as gelatin? If you do any research into the health benefits of gelatin, you will see bone broth come up again and again. In the past when people ate most of the parts of animals out of necessity, the bones went into the soup pot to make a broth. This broth contains the same proteins as gelatin. You can make bone broth and get the same health benefits as you will with gelatin, but it’s a lot more work. What does gelatin taste like? Gelatin has no flavor. The gelatin that you see in dessert packets at the grocery store have had flavorings and sugar added. Pure gelatin without those additives is flavorless, which means you can add it to anything. You truly can add gelatin to any smoothie you make because it has no flavor. Consider replacing your processed protein powder with this pure and natural protein source that will also give you so many other health benefits. You can experiment with the amount of gelatin that you add to your recipes, but one tablespoon per smoothie serving is a good general rule. If you find that the gelatin clumps up in your smoothie, there are a couple of things you can try. Dissolve your gelatin in a small amount of warm water, or whatever liquid is going into your smoothie, and then add it to the blender. Another option is to use hydrolysate gelatin, which dissolves in cold liquids. Here’s one of my favorite gelatin containing smoothies. For all of my smoothies featuring gelatin, click here. I’d love to know if you use gelatin in your smoothies or cooking and what health benefits you have experienced – please divulge in the comments below. Your local health food or grocery store likely carries gelatin. There are two brands of gelatin I recommend. Bernard Jensen’s 100% Pure Gelatin and Great Lakes Kosher Gelatin. Jensen’s gelatin contains a whopping 15 grams of protein per serving (1 tablespoon). Hi. Maybe somebody likes to eat supplements but I think that it is not the way to be healthy. I think, that the answer is in fresh vegetables and meat one time per week in maximum. I agree, Marius. Supplements are just that, supplemental to a great diet. Im at a time in my life where o crabe ice cream. I lack the will power to just quit ice cream althrough im aware it’s poison. So I started thinking what if I could find a supplment that I could enjoy as much as ice cream. One day I remembered how much I enjoyed jello. So I got the unsweeten jello & added my diet sugar to make up for sweetness in ice cream. Ive been eating so much jello instead of ice cream that I decided to look up if jello was bad for me. I very happy to have read your article. Thank you for writing it. It was published in 2016.